Iced teas and fruit juices are some of our Most Popular drinks. A well-balance drinks vending machine has a quality range of drinks including soft drink cans and bottles, milk products, water AND juices and teas. 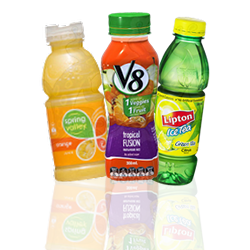 Our juices and teas are regularly rotated to ensure products are still in date and fresh. We also have the vending technology to track what juice and iced-tea products are more popular than others. This allows us to test and tweak different ranges, flavours and brands to ensure you, your staff and visitors to your vending machine are satisfied.